I have been a member of the Espacio Gallery for 4 years now and as other oportunities have come along, I feel it is time to end my membership and concentrate on establishing a presence at other commercial galleries. My work is being regularly shown now at the Tinca gallery in Portishead and the Mall galleries in London has also proved to be a place to be seen in. 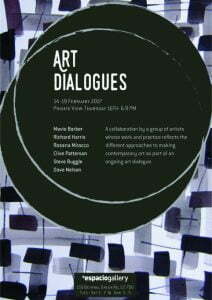 I am showing some new work in a show called ART DIALOGUES at Espacio from the 14 – 19 February in Bethnal Green Road and would welcome any visitors who might like to call by and see the work. I will be attending on Thursday 16 1 -7 pm and again on Sunday 19 from 1 – 5pm. You will be very welcome.